Between getting the kids ready for the day, making healthy meals, running to extracurricular activities, and keeping the house clean, it’s a wonder parents have any time left to themselves. 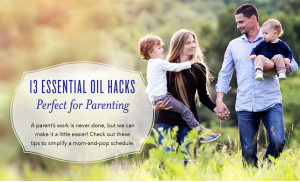 If you’re looking for a few ways to seize more from each moment, check out this essential oils guide full of parent resources. 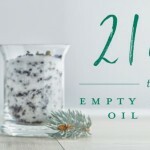 These hacks can help you simplify your schedule with essential oils for everything from cleaning to cooking to cooling down after a hectic day. Essential oils make freshening your home a breeze—even when the kids are running around. Add 5 drops of your favorite essential oil (we suggest Thieves® or Lemon) to a 2-ounce spray bottle filled with water. 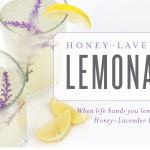 Shake thoroughly and spritz over linens, furniture, carpet, or throughout a room as needed! Kids aren’t known for their clean feet, so it’s no surprise that their shoes sometimes need a refresh. Clean stinky shoes in a snap with 2 tablespoons baking soda and 5 drops of your favorite essential oil. Mix together and sprinkle inside any shoes that need some extra care. Let sit overnight or longer, then shake out the baking soda. Let the kids play outside with this easy DIY spray that helps you stay annoyance-free. Combine 1½ ounces witch hazel, 2 ounces water, 1 teaspoon vegetable glycerin, 15 drops Citronella, 5 drops Cedarwood, 5 drops Eucalyptus Globulus in a 4-ounce spray bottle. Evenly spray onto exposed skin, rubbing in as needed. Keep your family’s clothes looking and smelling their best with the added boost of essential oils. Add 12–15 drops of oil to your washer and eliminate musty scents. You can also ditch the dryer sheets! Instead, infuse wool dryer balls with 3–4 of your favorite essential oils such as Citrus Fresh™, Peppermint, or Lavender. Reapply essential oils every 2–4 loads. Finally done with a long day of work, errands, meals, and after-school activities? Give yourself a moment to relax by using a carrier oil such as our V-6™ Enhanced Vegetable Oil Complex to apply Lavender and Eucalyptus Globulus oil to the bottoms of your feet. Create the ideal studying environment enhanced with the crisp and uplifting aromas of essential oils. Before homework time, add a few drops of Rosemary, Sage, Peppermint, or Eucalyptus Globulus to a diffuser. Being on the go means you don’t have time to do makeup touch-ups. Help your makeup stay put all day with this DIY makeup setting spray enhanced with skin-loving essential oils! When you finally have a moment to get to vacuuming, don’t let a musty scent distract from your hard work. Instead, try cleaning with essential oils! Add a few drops of essential oil to a clean vacuum filter and freshen up this household chore. Have to get up early to drive the kids to school or practice? 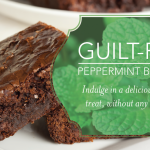 Ditch the coffee—instead go for the invigorating taste of fresh Peppermint. Add 1–2 drops of Peppermint Vitality™ to a cool glass of water and start the day right. Don’t waste time struggling through a mess of hair—whether it’s yours or your child’s. Simplify your hair care strategy with this detangler! Combine ½ cup Lavender Conditioner (or other Young Living conditioner), 1⅛ cup warm distilled water, 3 drops Cedarwood, and 3 drops Frankincense. Spritz a couple times into dry or damp hair and comb through to tame any mane. Want more hair care ideas? Check out our blog post devoted to essential oil detanglers! Car time can become chaotic, but the power of aromatherapy makes it more enjoyable for everyone. Add a few drops of oil to some tissues and place them on the dash of your car. 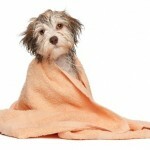 The warm sun will help disperse the scent while your car sits in the driveway or parking lot. Or try our USB Diffuser or Orb™ Diffuser for more on-the-go options. Not enough time to shower in the morning? Dry shampoo is sure to be your beauty BFF. For a naturally derived solution, combine ¼ cup cornstarch, 1 tablespoon baking soda, 2 drops Cedarwood, 2 drops Rosemary, and 1 drop Tea Tree. If you have dark hair, add 2 tablespoons unsweetened cocoa powder. Shake a small amount into your hair and massage the powder into your roots. After a few minutes, comb through your hair for soft, refreshed locks. See how easy it is with this video! Even if you want to avoid fast food and processed snacks, it can be hard to find the time to make homemade after-school snacks. Skip elaborate meal planning and cut down on prep time with the fast, fresh flavor of essential oils. We love this Citrus Sunshine Smoothie that’s tasty for the whole family!